Intex has come with their first Wearable device into the emerging market called the iRist smartwatch which was first seen in Mobile World Congress this year in Shangai. Coming to the features the device comes a 1.56 inch OLED display having 240×240 pixels resolution and protected by Sapphire glass. The iRist smartwatch runs on Android Kitkat 4.4 and the apps can be downloaded from Google Play Store. You can make and receive calls and messages and has Dual SIM option as well. The iRist smartwatch comes with 1.2GHz dua-core MediaTek MT6572 processor supported with 512 MB RAM and comes with 4GB of internal storage which can be expanded up to 32GB using microSD card. The device comes with 5-megapixel camera which is located on the right side of the watch which is capable of recording 720p or HD video recording and photos as well. There are all the other connectivity features like Dual-SIM connectivity and other features like 3G, Wi-Fi, Bluetooth 4.0 and GPS. 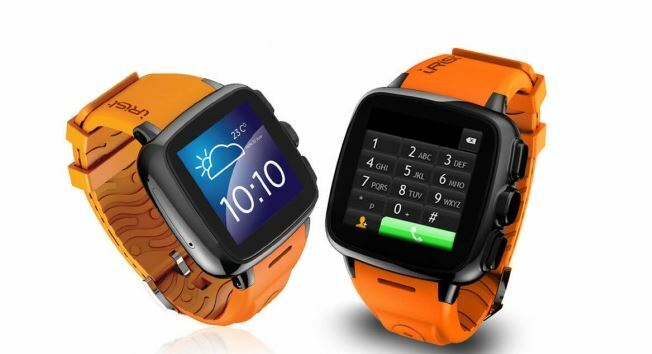 The iRist smartwatch runs on Android Kitkat 4.4 instead of Android Wear which will give it better battery backup. The device comes with IP65 rating which makes it water proof and Dust proof. The iRist Smartwatch comes with Pedometer which can count users steps all day. It is powered by 600mAh battery which is said to deliver up to 240 minutes talk time. iRist is available in three colors Orange, Pink and Black colors. The iRist smartwatch is available exclusively on eBay India from the first week of August and is priced at Rs. 11,999. You will be getting a Bluetooth headset along with the device. The device is built to take on the competition which is present in this price range and let’s see how good this smartwatch fares with Android 4.4 Kitkat and not Android Wear OS.